CHARGES DROPPED AFTER NEARLY FOUR YEARS IN COURT, 12,000 PAGES OF DISCLOSURE AND HAVING CONFESSED TO TRANSPORTING SHEEP. 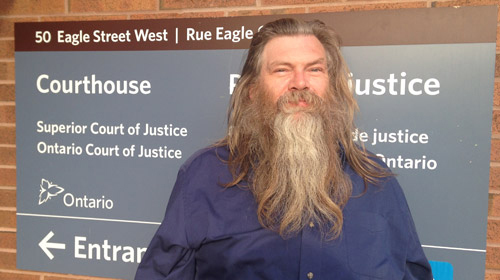 PHOTO – THAT’S WHAT 1,403 DAYS OF BEARD GROWTH LOOKS LIKE ON FORMER ACCUSED ROBERT PINNELL. “It has been 1403 days since my adventure with the legal system started. Today in the Superior court in Newmarket all charges in regards to me were withdrawn. In the beginning there were 4 of us charged with the disappearance of 31 Shropshire sheep. Myself, Robert Pinnell. Michael Schmidt. Susan Atkinson. And Montana Jones. Now after 1403 days Michael and Montana are the only ones left standing.